If you want to efficiently store large collections of data in memory. This library can dramatically reduce Full GC times and reduce memory consumption as well. When you have a data type which can be represented by an interface and you want a List for this type. The HugeArrayBuilder builds generated classes for the InterfaceType on demand. The builder can be configured to change how the HugeArrayList is created. Uses long for sizes and indecies. Uses column based data making the per element overhead minimal and speed up scans over a single or small set of attributes. This reduces memory usages by 2x or more. Stores attributes in direct memory as much as possible, reducing heap usage dramatically, 10x or more. 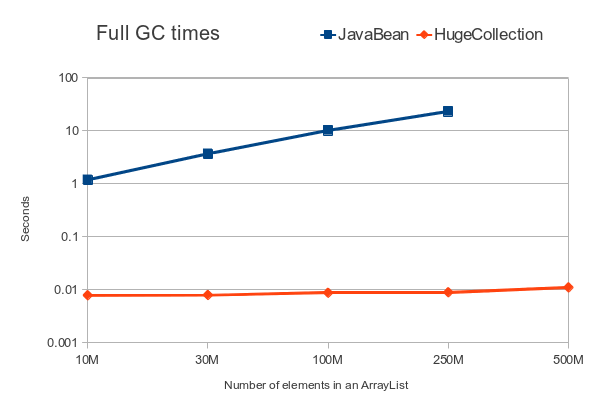 This test compares using HugeCollection vs ArrayList of JavaBeans. The class has 12 fields of various types which can be converted to primitives in different ways. By storing these primitives (or objects encoded as primitives), the time to perform GCs is almost eliminated. 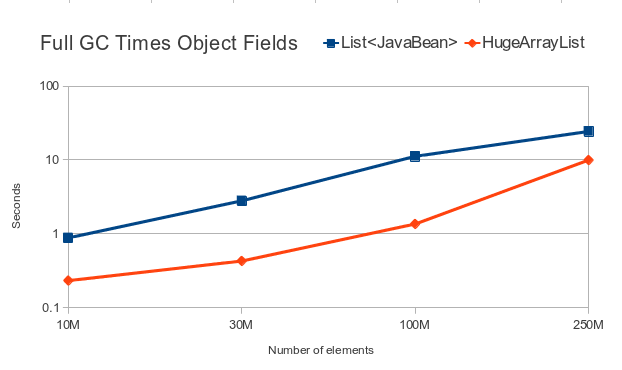 With 20 GB of free memory, only 250 million JavaBeans could be created and a HugeCollection can store 500 million elements. Classes with fields which cannot be encoded as primitives are supported in version 0.1.1 and still show an improvement in GC times. In both cases, the amount of memory used was halved. The best way to get the whole source, including tests is to use subversion.